When Ellen Roseman, author and consumer-advocate columnist for The Toronto Star, invited me to contribute to her new book, Fight Back, I was delighted. As you’ll read in my excerpted article below, Ellen was an instrumental pair of “eyes” in helping me fight back — and win! Going to court could have amounted to financial suicide for our family, or at the very least, hardship. There was no way I wanted to fight this battle in court, or even in an arbitration hearing. I wanted to fight it where the odds were more in my favour: the court of public opinion. And for most people that’s a good strategy. It’s a lot cheaper than hiring lawyers but it does depend on having good communication skills. In my experience most companies will do the right thing – but only under threat of having their behavior (which often amounts to bullying) exposed to the world. Everyone – from private enterprises, to public companies, to local and federal governments, is sensitive to public opinion. In the case of the furnace company, I drew a circle of the multiple “eyes” that I wanted to be aware of the problem. That circle included: my local city councillor, the City building department, the safety licensing agency for gas furnaces, the Better Business Bureau, the furnace company’s CEO — and consumer advocate columnist and author, Ellen Roseman, whose reach focuses many eyes on any problem. Create a circle of eyes for the problem you’re trying to solve. I sent an initial information package about the problem to each of those “eyes”. That package included a letter, before and after photos, emails between the company and me, and a timeline with significant dates and phone calls. As the situation evolved, I kept all of the “eyes” updated by email. When the company lawyer wrote to me privately, I replied and cc’ed all of them, including the CEO. I wanted everyone to be aware and watching how the company was handling the problem. This tactic ensured that the company CEO, governing bodies, and the media were all watching how the lawyer handled the problem. This small “consumer” problem, that she had wanted to fight quietly in court before a single judge, was now being fought publicly in front of many judges. With the furnace company, I limited the circle of eyes to the six listed above. However in dealing with other problems, I’ve increased the number of eyes dramatically by using the power of social media, blogs, radio, online news sites and online petitions. This helps spread the word and build support. One example of the success of this online strategy is a victory in my own front yard. I wanted to persuade my municipal government to overturn an official’s decision, which prevented us from replacing an interlocking brick driveway with a permeable driveway. The official said “it would be illegal” due to existing bylaws. I wrote blog posts and used social media to raise awareness of the outdated bylaw. But the media buzz wasn’t enough on its own. The pivotal moment came when I picked up the phone and called the mayor’s office telling them why we wanted to build a permeable, green driveway. They agreed it was a good idea and we won approval to build it as a pilot project. The faulty installation of our furnace and ductwork caused structural damage to our house. I called in a structural engineering firm to do an assessment and report. Their third party evidence helped strengthen my case. And of course all of the “eyes” got copies of the report. I have used experts to write reports to help solve other problems over the years. A neighboring apartment building was forced to repair their leaky eavestroughs, after an engineer’s report showed the water damage it was causing to our property. Ultimately, the resolution for the faulty furnace installation came from picking someone’s brain. I was making good headway using the “eye” strategy, but I still didn’t have what I wanted: a big cheque to pay for repairs. So I asked for advice. My city councillor agreed to set up a meeting for me with the head of the building department. I brought in all my records, laid them out, and asked his advice. He took one look at my file and told me I had made a mistake on the date of the building permit. My jaw dropped open. He went over to his filing cabinet and produced the building permit record which showed that our furnace had been installed in the fall. I was flabbergasted. I told him that was absolutely impossible because the furnace was installed in the spring. In fact we were both right. The furnace installation company had applied for the permit six months after the job was done, a practice which is illegal since it prevents the building inspectors from assessing the safety of an installation. The company quickly settled out of court knowing that many eyes were watching what it was doing. 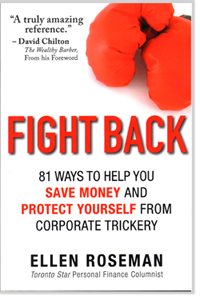 Excerpted from Fight Back: 81 Ways to Save Money and Protect Yourself from Corporate Trickery. Copyright (c) 2012 by Ellen Roseman. Excerpted with permission of the publisher John Wiley & Sons Canada, Ltd.
Ellen Roseman is a journalist who sticks up for ordinary Canadians. As a long-time advocate for consumer rights, she’s become a brand name for activism and a champion at helping consumers fight back against injustices. Her columns appear three times a week in the Toronto Star and her popular blog, EllenRoseman.com, has been online since 2007. She’s the author of seven books, including Money 101: Every Canadian’s Guide to Personal Finance and Money 201: More Personal Finance Advice for Every Canadian. She teaches investing and personal finance at the University of Toronto’s continuing studies department and Ryerson University’s Chang School, and is on the board of FAIR (Canadian Foundation for Advancement of Investor Rights) and Community Legal Education Ontario (CLEO). In Fight Back, Ellen Roseman distills the financial advice she gives in her columns and blogs into 81 quick tips that all Canadians can use to help them spend sensibly, save money, and avoid costly consumer traps. This book of “personal finance greatest hits” is filled with illustrative examples and cautionary advice from Roseman and stories from her faithful readers. Filled with a wealth of information, the book includes the low-down on dealing with banks and car dealers, cutting costs of communication services, improving your credit, buying and renovating a home, fighting online fraud, ensuring you have the right insurance, and more.